According to an ESPN report, the Milwaukee Bucks are planning to conduct a search for their next general manager. John Hammond’s contract was up after the upcoming season and he received permission to interview in Orlando, where he signed a five year contract to become the new general manager for the Magic. Assistant general manager Justin Zanik, who was hired from the Utah Jazz earlier in 2016, was reportedly considered to be the GM-in-waiting, expecting to move into the job when John Hammond’s deal was done. In ESPN’s Mark Stein’s report, Zanik will interview for the GM post and be given strong consideration to succeed Hammond, but nothing has ever been promised. Zanik will run the Bucks front office during the process, with the NBA Draft coming up on June 22nd. 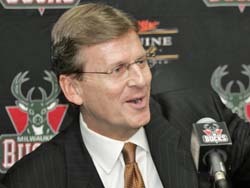 Milwaukee Bucks general manager John Hammond is leaving his job in Milwaukee to take the GM post with the Orlando Magic. Hammond gets a five-year deal with the Magic and joins former co-worker Jeff Weltman in Orlando. The two worked together in Detroit for a year before Hammond took the job in Milwaukee and brought Weltman with him as his assistant general manager. The Milwaukee Bucks have given general manager John Hammond a one-year contract extension that keeps him in Milwaukee through the 2017-18 season. According to reports, assistant general manager Justin Zanik would assume the general manager duties when Hammond’s new deal runs out. Zanik was hired to a multiyear contract. The Bucks are entering their third season under the new ownership of West Edens, Marc Lasry and Jamie Dinan. They’re hoping to improve on the 33-49 season of a year ago. Hammond has been the Bucks general manager since 2008. He was named the NBA’s Executive of the Year in 2009-’10. The NBA free agency period opened at 11 p.m. Thursday night. The Bucks have nothing to report at the moment, but they do plan to be active. They’re searching for backcourt help and perimeter shooting. The Milwaukee Bucks have a new assistant general manager. Thursday the team officially announced the hiring of Justin Zanik, who comes to Milwaukee after fulfilling the same role with the Utah Jazz for the past three season. The 41-year-old Zanik will be directly involved in management of the day-to-day basketball operations.